← Lunch In A Hurry? Quiche Is the Answer. Well, in addition to the neighborhood association brochure that I was volunteered to write, it turns out that the departmental farewell to one of Mrs. E.’s colleagues is going to include a few more people than just the department. We’re hosting, I’m really not sure how many, a few hours after my daughter’s end-of-year school picnic. So, I apologize for being a bit scarce of late. Things have been hopping ’round the manse. Fortunately someone thought fit to make it a bring-a-bottle-and-hors d’oeuvre-party, which I don’t normally condone, but it does take a bit of the heat off. Again, I have no real idea of the number who will attend. Still, a minimum effort is required on our part. I’ll round up a case or two of wine and ice down some beer, restock the bourbon and vodka and check on the mixer situation. Do you know what people remember about our parties? They are usually “dressy” affairs and that is the third most popular answer. “Champagne!” is the second (it’s usually a Crémant). But, it seems that people remember our cloth napkins first and foremost. Whilst I have yet to find a bargain cloth napkin, I can highly recommend World Market for cases of Champagne flutes and wine goblets. You can never really have too many, you know. Despite what the Fire Marshal may say. See you as soon as possible. 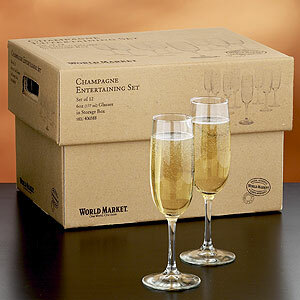 This entry was posted in Entertaining and tagged Champagne Flutes, Entertaining, World Market. Bookmark the permalink. Cloth napkins and champagne?!! Sign me up! I am a huge fan of both, I must admit. I try to always have at least one bottle of champagne on hand at all times, you never know when an impromptu celebration will occur! Those cheap flutes are great if you don’t want to risk nicer crystal glassware, it seems every time we have a gathering at least a couple of them are accidentally knocked over. As a standard for our parties we provide a predetermined amount of bottles and hors d’oeuvres, depending on how many guests we think we’ll have; all laid out in a menu ahead of time. Anything not on the menu that guests might like or if the party gets larger than we thought, we suggest guests bring something to add. I agree about Cost Plus flutes and wine goblets. I even use their plain white catering style plates. Best of luck with all the festivities! I would love to see some photos of your set up. People seem to remember my cocktail napkins, as well. Not because they are cloth mind you, but because I had “Betty Ford Clinic” printed on them. Poor taste, I know. You are an inspiration, cloth napkins, so easy and elegant. Do show us your napkins! I must admit, I thought you were going to show us a case for my flute! I agree – they remember cloth/linen at the table and bar. I find the best deals on this sort of thing in January, usually crystal and marked way down. I discovered “stemless” wine glasses (Riedel is a lovely brand in crystal) and I’m not sure if they have stemless for champagne also. Breakage is less with stemless and they are quite chic in my opinion. However, World Market is the way to go for economy and larger gatherings. The Riedel petite “Chardonnay glasses” are delicate so fun to use – also good for special gifts. I’m sure your parties are a smash! I must confess, I am a true believer when it comes to proper stemware. Champagne in glasses without stems would feel like a party dress without wearing pumps . . . the elevation is needed for ladies at special occasions, and the traditional stemmed glasses are a must if serving champagne. They can be rented pretty inexpensively, too, for very large crowds. Every couple should at least buy two as a treat to themselves. Let the collection grow over time, mixing patterns and styles of glasses. I have a source for very inexpensive and good looking cloth napkins. Just gave a brunch for 80 ladies when the Executive Director of Wilton House Museum left to head another institution. Luckily I have cloth napkins, champagne flutes and glass plates (dessert/salad and luncheon/dinner) for about 100….and it was so easy. I get my “large party” napkins from a linen company that sells through Amazon.com and they are cotton…. and starch and iron beautifully. About $19 for a dozen for the 12″…..the cocktail napkins are less I believe. Ms Forman, could you pass along a link to the company, please? I like to collect vintage linen and mix and match, but those prices are too good to be true. I have good firends who put out large cloth napkins as guest towels in the bathroom at parties. So much nicer than the paper monogrammed ones.